A University of Maryland Team has won the 2015 Revolutionary Aerospace Systems Concepts - Academic Linkage (RASC-AL) student design competition. The competition, sponsored by NASA and managed by the National Institute of Aerospace, provides university-level engineering students the opportunity to design human scale architecture concepts based on NASA engineering challenges and offer NASA access to new research and design projects by students. Through RASC-AL, student teams and their faculty advisors work to develop mission architectures that employ innovative solutions in response to one of the 4 following themes: Earth Independent Mars Pioneering Architecture, Earth Independent Lunar Pioneering Architecture, Mars Moons Prospector Mission or Large Scale Mars Entry, Descent and Landing (EDL) Pathfinder Mission. This year's competition challenged students to design a mission with supporting technologies that would enable astronauts to be less reliant on resources transported from Earth. The UMD team, led by Professor Dave Akin and comprised of students in Aerospace Engineering's ENAE 484 class, not only won first place overall with their Mars exploration themed project Asimov City, Mars: Developing a Permanent Earth-Independent Settlement on Mars, but the team also placed first in the undergraduate category. "Incredible props go to the competition team of Jaclyn Rupert, April Claus, Isabel Martinez and Samantha Walters, and all of the other 29 students in ENAE 484," Akin said, "And to Dr. Mary Bowden and Dr. Andrew Becnel who teamed with me in mentoring the project." The team's project outlined a Mars settlement that incorporated the moon as a fueling stop for Mars-bound space craft, and they developed a strategy for creating fuel from lunar surface materials. "Some of the teams had ideas that NASA might be able to use as we venture out beyond low-Earth orbit,” said Pat Troutman, Human Exploration Strategic Analysis lead at NASA's Langley Research Center in Hampton, Virginia in a NASA press release. “The judges and I were impressed by the students' engineering skills and innovative thinking." The 33-student team put in long hours through the course of a single semester to complete their project, and according to team member and recent grad April Claus (B.S., '15), it seemed like an impossible task. "It was a huge team effort," Claus said. "Our success at the competition was the perfect end to our space track experience. I've never worked harder on a project, but I've also never been prouder of the outcome." Claus worked on the team as a member of the Power-Propulsion-Thermal group and evaluated various power systems and performed trade studies to determine the optimal system. Once they settled on a nuclear powered system as their approach, she spent much of the remaining semester getting as up to speed as possible on nuclear engineering and reactor design. In addition, she worked on payload and propellant massing. Team member Samantha Walters, who spent most of her time on the mission architecture and launch scheduling, systems integration and refueling operations, agreed that it was also one of the most challenging, but rewarding, projects she worked on as an undergrad. "This project taught me so much, not just about engineering, but about teamwork and systems integration," Walters said. "And having professionals tell us that what we did was so impressive felt really good." The experience should serve Walters well. Her next step after graduating in August will be working for NASA's Jet Propulsion Laboratory next year as an operations engineer. Jaclyn Rupert (B.S., '15) wore many hats on this year's team—such as leading the Crew Systems sub team and Crew Transport Vehicle (CTV) focus group as well as co-leading the Steering Committee to name a few. In addition, she worked on some of the projects technical aspects such inflatables optimization, habitat and CTV restocking and mass/volume breakdowns, risk analysis and the crew Mars module layouts. While the entire experience of developing their project was one of the most rewarding and educational experiences she's had, what she enjoyed the most was the camaraderie between all the competitors and judges at RASC-AL during the forum. "It really demonstrated that while it was indeed a competition," Rupert explained. "Our love of space and the advancement of space exploration was really what was important at the end of the day, and was a common thread that we all shared." Since graduating, Rupert has taken a position with Sikorsky Aircraft in West Palm Beach, Fla. as a Flight Test Engineer working primarily on the CH-53K helicopter. 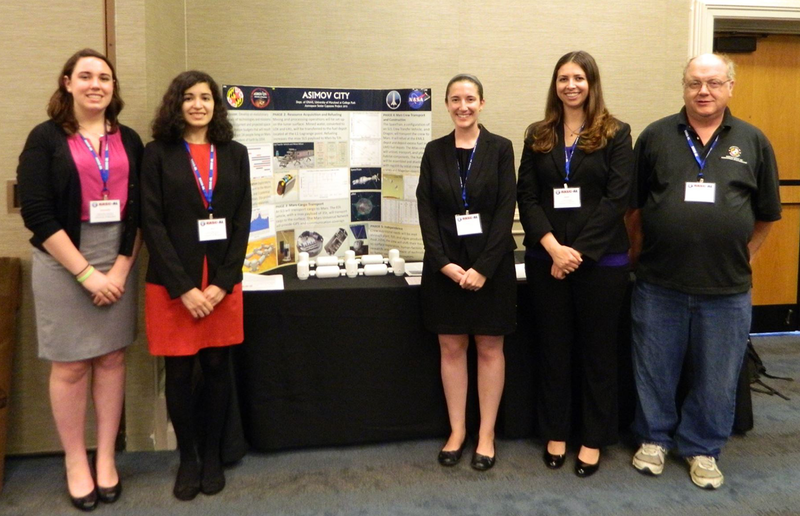 As part of their win, the team is invited (and provided with a travel stipend) to present their design project to industry experts at the American Institute of Aeronautics and Astronautics Space 2015 conference in Pasadena, Calif. held August 31 through September 2. The 2015 RASC-AL featured 16 teams, representing universities including Virginia Tech, University of Colorado, Georgia Tech, University of Illinois, University of Texas and Penn State.